Matt C: A couple of books are leaping out at me this week. First off, it's a graphic novel: Avengers: Rage Of Ultron. I've not really paid much attention to Marvel's latest 'Original Graphic Novel' line since it launched with the lacklustre Avengers: Endless Wartime. This new one's a far more appealing proposition though. 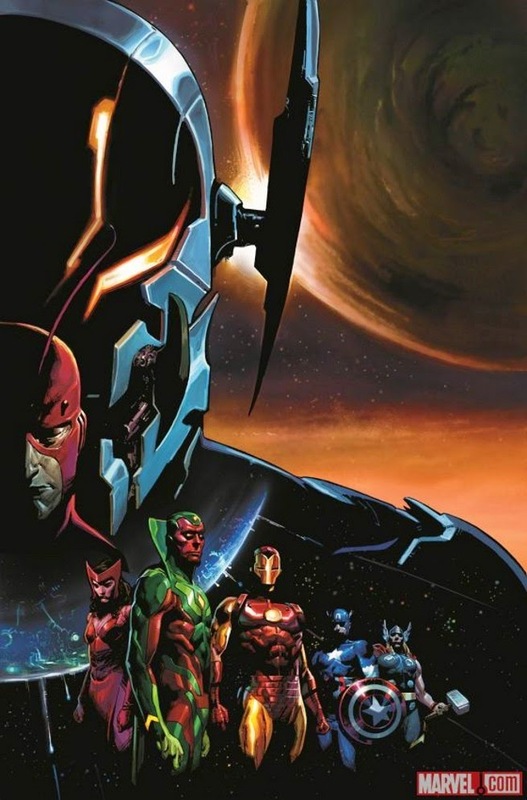 A done-in-one tale where Ultron sets his sight on Titan, the birthplace of Thanos, it features the stellar writer/artist team of Rick Remender and Jerome Opeña. Fans of their work on the original volume of Uncanny X-Force know that they bring a special kind of combined alchemy to the table, and the spectacular preview art suggests that this isn't simply a cash-in on the forthcoming movie with almost the same name, but actually a very worthwhile entry into the canon. At $24.99, it better be! My other highlight is Kanan: The Last Padawan #1, which acts as a prequel to the excellent Star Wars Rebels TV series, and will presumably detail the events that led to Kanan escaping the Jedi Purge that followed Order 66. I may give Uncanny Inhumans #0 a look as Marvel's continued initiative to make the Inhumans one of their premier properties now sees them rope in artistic heavyweight Steve McNiven to help things along. I'm still not convinced it's going to work, and that fanboys will be speaking of the Inhumans with the same reverence and excitement as, say, the Avengers or the X-Men, but I can't fault them for there perseverance! Stewart R: Wow, that proved to be a bigger pull-list than I was expecting, and with it comes the opportunity to take a literal 'by the numbers' approach to On The Pull for me this week! First up would be Charles Soule teaming up with Steve McNiven for Uncanny Inhumans #0, a sister title to Soule's Inhuman, looking at what Black Bolt is up to these days and doubling the amount of time this fine writer gets to play in the Terrigen-tinged sandbox! Then, like Matt, I'll be diving into Kanan: The Last Padawan #1, but since I've only seen a handful of episodes of Star Wars Rebels the main draw for me has to be Pepe Larraz's illustration as it really did catch the eye when he drew an arc for the aforementioned Inhuman title. Writer Greg Weisman has a pretty rich writing history for animated TV series and it'll be interesting to see how he makes the transition to a monthly comic. Onto the twos now and after a bit of a break - a Winter hibernation perhaps - the Squarriors are back for their second issue from Devil's Due and it'll be here where we get to see if the wait has been worth it and the tension holds up. There's been a slightly lesser delay for Jonathan Hickman's Dying and the Dead #2 and I'm excited to see what we get in yet another bumper-sized issue from Image, the debut having impressed me in its highly secretive and teasing way. Swinging round and pointing at those threes I'm finding myself facing a mixed bunch. I've not been grabbed by Spider-Gwen yet and if this chapter fails to dig in its hooks I'll have to bail out. Cluster #3 and Uncanny Avengers #3 however are definite lock-ins, the former impressing with its expanding scope across two issues and the latter really seeing Rick Remender find his groove once more in the Marvel Universe. Finally, I'll give a nod in the direction of a #1 comic that's actually getting a second bite of the cherry - yes, it's Nonplayer #1 getting a reissue from Image this week! Heralded as a terrific opener way back in June 2011, the sophomore issue never materialised due to some personal issues that struck creator Nate Simpson shortly after the debut's release. We even covered its disappearance in our 'Where Are They Now' feature last August, but now it seems that, four years on, we'll get the continuation of the story when #2 finally hits shelves in June. The first issue was a true sight to behold (check the preview art here for evidence) and I'm still a firm believer that the potential within Nate Simpson's gaming reality drama can still see this series become a hit.